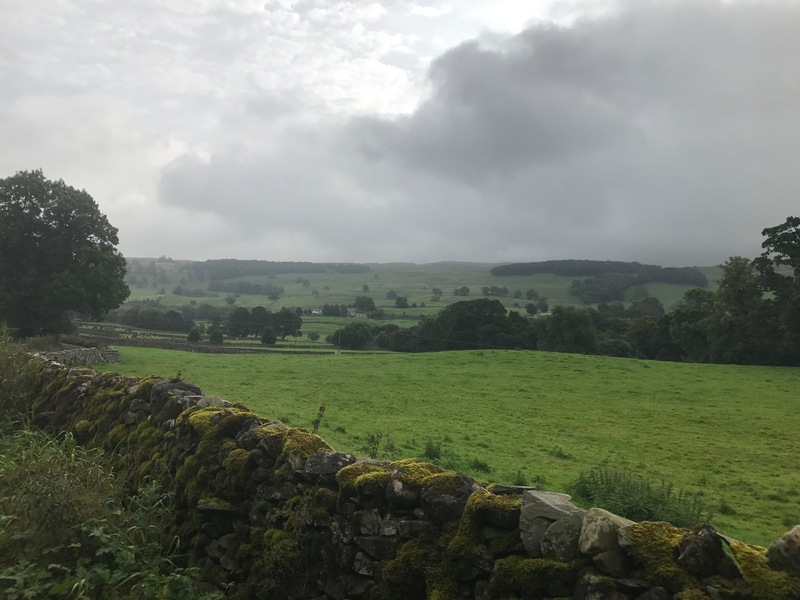 Day One: Giggleswick to Ribblehead. Our travel day (yesterday) was not very good. A delay on the tarmac with our first flight meant we quite literally had to run to the connecting flight. No problems with our train connections. Due to the limited time between flights, our luggage ended up on the next flight to Manchester, England – so we arrived 9 hours before it did. We were assured that our luggage would arrive at our hotel later that night. However, after no luggage, I called the airline ad the delivery company and we were told that it would arrive in the morning. Morning came (think: 2 days in the same clothes with no toothbrush) and we received a phone call stating that our luggage would arrive in the evening. After 2 further calls, we had the luggage rerouted to the next hotel. Mom and Dad opted not to walk today (they didn’t have appropriate shoes) and were able to get a ride to the next hotel from the proprietor of our Inn in Giggleswick. 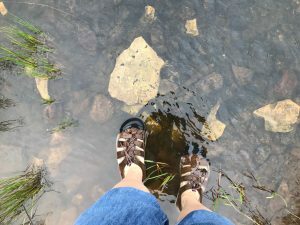 I opted to walk because I had my hiking sandals – even though I had no rain clothes, and only had my jeans and t shirt that I had been wearing for two days. The day began overcast, and although cool, I didn’t feel the need for a jacket as we started. As we began walking, I realized that this is Yorkshire! As a kid, I loved the James Herriot books – reading them over and over again. I had the sudden realization that this is his country! How exciting!. As we walked across the moors and saw the lambs, I though back to the passages in the books about Herriot walking across the moors in cold rain, and snow to find sheep that were having trouble with lambing or a cow that wasn’t doing well. I had a picture in my head that I had imagined from the books, but walking across the moors on a cold, windy, rainy day brought it to life. One thing about the moors…. With the rain, and with the cattle and sheep in the fields, they become very wet (lots of standing water) and thus very, very muddy. One thing that you learn quickly is that you dont step into puddles that have black mud in the bottom…. You will end up in calf deep mud that threatens to take and keep your shoes. The trail from Settle to Carlisle is not an actual track. It actually follows many different trails and foot paths. Today, we started on the Ribble Way as we left Giggles wick, and then spent most of the day on the Pennine Way. The last mile or so was actually along the road. We passed through towns and villages such as Langcliff place, Stackhouse, and Stainforth before heading up the hill and over the moors. The day was very cloudy and there was only a misty rain up to this point. We come down from the moors and entered the hamlet of Helwith Bridge before walking along the River Ribble once again. As we were passing Craghill Farm (where many of the sheep were directly on the path), the rain started to get heavier. We stopped at Horton in Ribblesday for a quick lunch, standing under trees to shelter us from the rain. From there we climbed back up into the moors. Here is where the wind and rain started in earnest. I was not prepared (all of my hiking stuff was in my lost suitcase). We passed my Panyghent, which is one of the three tallest Yorkshire peaks. There is a special certification/award/recognition for those who climb all three peaks in one twenty-four hour period. This might be fun to do one day! Coming down from the moors at Lodge Hall and Ashes, we followed the road for the last couple of miles where our taxi picked us up at Station Inn. He was actually there waiting for us to arrive. We were all soaked to the skin – at those of us that didn’t wear their rain gear (or waterprroof as they call them here). My sandals had help up well, and my feet were never cold, but as my light jacket wasn’t waterproof in the heavier rains, I was not only wet, but cold too. A short taxi ride took us to the Riverside Lodge in Ingleton. The Riverside Lodge was fantastic. They met us at the front door and took us directly to our rooms (where my suitcase was waiting for me!). I was starting to take off my wet clothes almost before the gentleman was out the door. I couldn’t wait to get into a hot shower. The hot shower thawed me out, and I headed back downstairs to check on my parents who had not hiked today. In the lounge, the proprietor had laid out tea and coffee with scones with jam and cream. The cream is not like ours – it is much heavier and thicker – think of cream that almost had the consistency of room temperature butter. So good and some hot coffee really hit the spot. While I was enjoying tea, the proprietor took my wet clothes and dried them for me! Before long we were heading to diner where I finally had my English Fish and Chips. What a great way to round out the day! Love this! Envisioning this as I read it! How awesome!! !